Why would a seriously committed Christian write a book about the Twelve Steps of Alcoholics Anonymous as a means of spiritual growth for Christians? This work offers guidelines and exercises which reveal the importance of the ongoing process of healing. Miller shows how the Twelve Steps can be used to draw a person to a life-changing relationship with Jesus Christ. J. Keith Miller has also written "The Taste of New Wine" and "Hope in the Fast Lane". 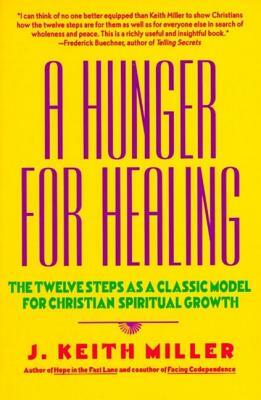 A Hunger for Healing by J. Keith Miller was published by Harper and Row in January 1993 and is our 24757th best seller. The ISBN for A Hunger for Healing is 9780060657673. Be the first to review A Hunger for Healing! Got a question? No problem! Just click here to ask us about A Hunger for Healing.